• 48-Hour Hop-on, hop-off double-decker sightseeing bus tour with a professional guide and unlimited access to the Downtown, Uptown and Brooklyn loops. • Liberty Helicopter’s Big Apple Tour ticket! 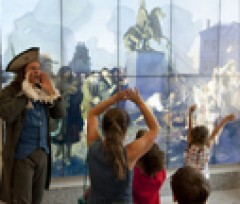 • Added bonus includes a free Night Tour, unlimited hop-on, hop-off access to New York Harbor Ferry and the Eat and Play Discount Card. Get ready for the ultimate New York sightseeing adventure: Liberty Helicopter’s Big Apple Tour combined with the All Around Town 48 Hour Bus Tour! This highly popular airborne excursion places you inside a state-of-the-art helicopter. As you lift off and soar into the sky, you’ll see many of New York’s classic, iconic landmarks come into view. In 15 minutes of jaw-dropping amazement, you’ll see the Empire State Building, the United Nations, Central Park, the U.S.S. Intrepid, along with Governors and Ellis Islands and the Statue of Liberty. This is one of those experiences you’ll remember forever. After this exhilarating helicopter ride, hop on to one of our double-decker buses. Sit back and relax as our knowledgeable tour guides walk you through the history and background of 4 of New York City’s most spectacular neighborhoods – Downtown Manhattan, Uptown Manhattan and Brooklyn! Pass by must-see attractions like Times Square, the Brooklyn Bridge, Central Park, and more. Hop on and off as you please to check out the different neighborhoods. This package deal is bound to give you the full New York City experience! • This Big Apple tour offers a bird’s-eye view of the most photo-worthy sights. • See NYC icons: Times Square, the Statue of Liberty, the Empire State Building and more! - Please note that helicopter tours do not operate on Sundays. - Reservations are required. Please call 1-800-542-9933 to confirm your trip. - Government issued ID is required. - A $40.00 per person facility/security fee is payable at the heliport. - Other fees may apply at the heliport. - No refunds, no exceptions. - Please call 1-800-542-9933 to confirm your trip. 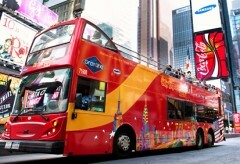 - The Big Apple tour includes live pilot narrated commentary using state of the art headsets for all passengers. - Heliport hours, prices and tour routes subject to change.